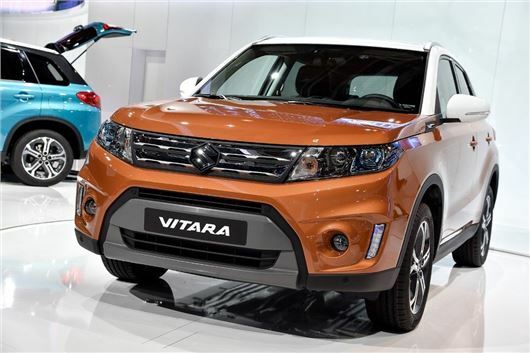 Suzuki has unveiled the next generation Vitara at the Paris Motor Show. It hits UK showrooms in Spring 2015. Despite being a small SUV with a familiar name and which is now quarter of a century old, the Vitara has to date managed to sit slightly askew of the wildly popular crossover SUV group that is forming an ever-more-lucrative slice of the family car market. Unlike 25 years ago, the Vitara now finds itself among a raft of similarly small SUVs – the Nissan Juke, Renault Captur and Vauxhall Mokka to name a few – so Suzuki will this time focus on improved cabin ambience and day-to-day comfort, rather than making it an incongruously effective mud-plugger. That said, it will get Allgrip four-wheel drive as an option, for the few buyers that require it. In an effort to appeal to more style-conscious buyers there will be a selection of two-tone paint options – plus there will be a selection of customisation options for the cabin. Suzuki will offer the Vitara with a choice of two 1.6-litre engines, one petrol and one diesel. Both the petrol and diesel engine produce 120PS, however the torque outputs are different. The petrol produces 156Nm at 4400rpm, while the diesel produces a more useful 320Nm from 1750rpm. The petrol comes with a five-speed manual as standard and is offered with the option of a six-speed auto, while the diesel comes with a six-speed manual only. Emissions figures are to be finalised, but Suzuki expects the petrol to produce 123g/km in manual form and 127g/km in automatic form. All-wheel drive petrol variants produce 134g/km and 138g/km, respectively, while the diesel produces 106g/km in front-wheel drive form and 111g/km in all-wheel drive form. The Vitara gets up-to-date safety equipment including active systems like adaptive cruise control and automatic braking, as well as a high level of passive safety specification thanks to lightweight but strong bodywork.